Boom Boom Thai uses their own specialised couriers to deliver their food. Juicy prawns wrapped in wonton blanket and fried fill crushed. Lightly battered calamari seasoned with salt & pepper served with sweet chilli sauce. Crispy wings served with sweet chilli dipping sauce. 2 x Salt and Pepper Prawns, 2 x Salt and Pepper Fish and 2 x Squid. Deep fried tofu served with crushed peanut and sweet chilli sauce. The shredded green papaya, roasted peanut, tomato and green been mixed with traditional dressing. Breast chicken with green bean and Thai basil. Juicy prawns in coconut batter serve with dipping sauce. Spring roll, curry puff, chicken satay, fish cake, chicken wing, money bag. Crab and chicken mince with dipping Thai style sauce. Classic Thai spicy soup with roasted chilli jam, fragrant lemongrass, galangal and kaffir lime leaves. Asian style handmade chicken wontons made from breast fillet, asian greens vegetable and egg noodle. Thin rice noodle soup with vegetables. Noodle soup with chilli jam, mixed vegetables, coconut milk. North East Thai style char grilled marinated thick sliced beef served with stir fried mixed vegetables and served with sweet chilli sauce. Char grilled octopus served with stir fried mixed vegetables and sweet chilli sauce. Char grilled marinated lamb cutlets served with stir fried mixed vegetables and served with sweet chilli sauce. Grilled salmon fillet served with stir fried mixed vegetables and sweet chilli sauce. Thai-Style grilled steak With dry chilli dipping sauce. Char grilled marinated beef with sliced cucumber, mint, red onion, coriander, shallots and carrot, drizzled with chilli and lime dressing. Marinated char grilled chicken with sliced cucumber, mint, red onion, coriander, shallots and carrot, drizzled with chilli and lime dressing. Char grilled octopus with sliced cucumber, mint, red onion, coriander shallots, kaffir lime leaf, lemongrass and carrot, drizzled with chilli and lime dressing. Sliced roasted duck with sliced cucumber, mint, red onion, coriander, shallots, lemongrass and carrot, drizzled with chilli and lime dressing. Fine diced roasted duck salad with finely roasted rice, dried chilli, mint, coriander, red onion and shallot. Grilled salmon fillet served with dried chilli, cucumber, coriander, mint, garlic, red onion. Roasted peanut, green beans, cherry tomatoes, chilli crushed in a mortar and pestle with lime juice served with papaya strips. Popular Thai-Style grilled steak mixed with mints, red onion, shallots, dry chilli and Thai dressing sauce. Popular Thai traditional salad grilled salmon mixed With mints, red onion, shallots, dry chilli and Thai dressing sauce. 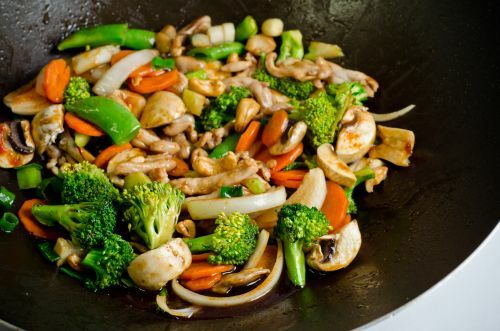 All stir fried include mixed vegetables. Stir fried thin rice noodles with egg, crushed peanuts and tofu in Boom Boom's pad Thai sauce, recommended with king prawns. Stir fried singapore noodle with egg, garlic and sesame sauce. Stir fried flat rice noodles with egg and chilli sauce. Stir fried vermicelli noodles with egg and tom yum sauce. All dishes come with vegetables except massaman, recommended accompanied with roti. Stir fried thin rice noodles in BoomBoom Thai's pad Thai sauce with char grilled king prawns. Boom Boom Thai famous pad thai with chicken , prawn and thin noodle. Stir fried chicken and beef with vegetables with chilli jam sauce. Char grilled king prawns topped with creamy sweet chilli basil sauce. Stir fried garlic and chilli king prawns with kaffir lime leaves peppercorns and seasonal vegetables. Stir fried garlic and chilli with kaffir lime leaves and peppercorn and seasonal vegetables. Deep fried salt and pepper squid served with sweet chilli sauce. Deep fried salt and pepper fish and served with sweet chilli sauce. Deep fried salt and pepper prawns and served with sweet chilli sauce. Boom Boom style spicy stir fry chicken pieces or prawn with garlic, fresh chilli, crispy basil. Char grilled marinated lamb cutlets topped with creamy red curry sauce. Grilled salmon fillet topped with the sauce your choice and mixed vegetables. Spicy stir fried lamb and Thai herb, fresh chilli, coconut cream. Char grilled marinated garlic and pepper lamb cutlets topped with massaman curry sauce and served with baby potatoes, peanuts and onions (recommended accompanied with roti). A side of tender roasted duck with cinnamon stick, shiitake mushrooms and plum sauce (less bone). Maryland fillets fried crispy with steamed veggies and sweet chilli. With honey and chocolate, caramel sauce.